Buckwheat cereal can be used from the age of 6 month as a supplementary food and as a calorie boost for babies who need halp gaining weight. 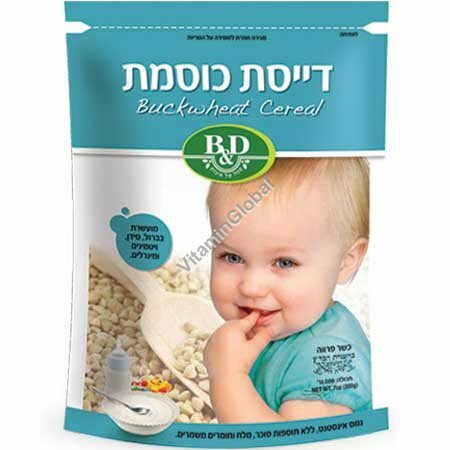 Buckwheat cereal is made using only natural processes and the highest quality ingredients and recommended as a supplementary source of nutrition for babies, children and adults. Ingredients: Buckwheat (96%), vitamin and mineral blend (3.5%). Vitamins: C, E, A, B1, B2, B3, B6, B12, C, D3, E.
Minerals: Calcium Lactate, Iron, Folic Acid, Potassium, Phosphorus, Zinc, Iodine, Selenium. Buckwheat cereal is suitable for use with any liquid. Prevent lumps - it is not recommended to use boiling liquid. Instead, slowly add the powder to lukewarm liquid while stirring. Bottle-feeding with watery cereal (recommended at first): Add 2-3 tablespoons of powder to 200ml of liquid and shake well. Spoon-feeding with thick cereal: Add 3-5 tablespoons of powder (as desired) to 200ml of liquid and mix well. Buckwheat cereal is also suitable foe adding to soup, fruit and vegetable purees. Kosher under the Rabbinical Supervision of Badatz Haeda Haharedit.